March 28-April — 1946. Seattle, Washington. A Japanese American draft resister is released from prison and returns home to find nothing is as it once was. He struggles to piece together his war torn world. Ken Narasaki’s stage adaptation of John Okada’s ground breaking novel “No-No Boy” is scheduled for its world premiere March 27 at the Miles Memorial Playhouse, 1130 Lincoln Blvd., Santa Monica. Originally published in 1957, the novel was re-discovered and republished in 1976 and has since become a staple of Asian American studies programs in universities across the country. 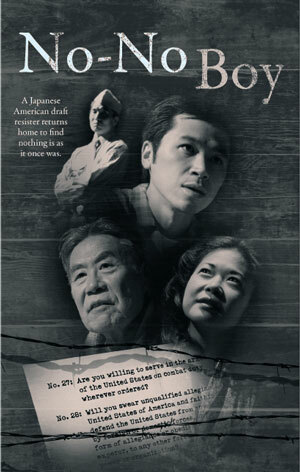 “No-no boy” refers to draft-age Japanese American men who refused to sign a loyalty oath administered in the internment camps; many of these men were ostracized after the war ended. Set after World War II as Japanese Americans return to the West Coast, the play follows draft resister Ichiro Yamada after he is released from prison and struggles to come to terms with the consequences of his choices, while the rest of the community tries to get back on its feet after a war that has uprooted them all. The same artistic team produced “Innocent When You Dream” (Critic’s Choice LA Times, Pick of the Week LA Weekly), which had a successful run at Electric Lodge in Venice and was later invited to perform at the Smithsonian Institute (Washington, DC) in 2008. Performances: Friday and Saturdays at 8 p.m.
Saturday and Sunday Matinees at 3 p.m.
Timescape Arts Group (non-profit 501 (c) (3)) and this production is supported, in part, by a grant from the California Civil Liberties Public Education Program.